Reduction in poverty. Increased national output means households can enjoy more goods and services. For countries with significant levels of poverty, economic growth can enable vastly improved living standards. For example, in the nineteenth century, absolute poverty was widespread in Europe, a century of economic growth has lifted nearly everyone out of this state of poverty. 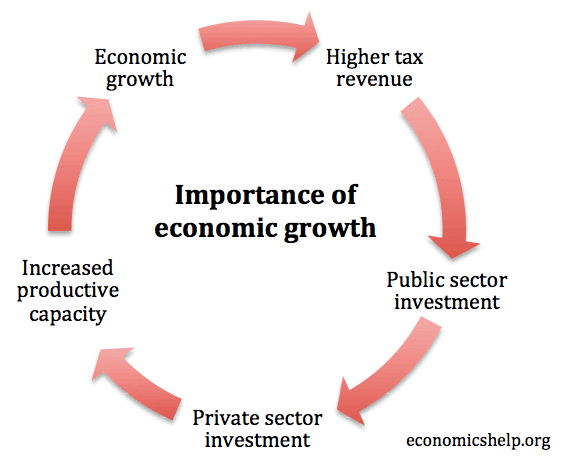 Economic growth is particularly important in developing economies. Reduced Unemployment. 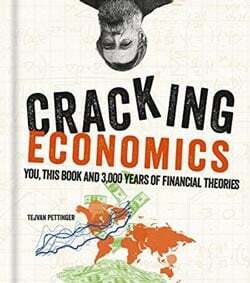 A stagnant economy leads to higher rates of unemployment and the consequent social misery. Economic growth leads to higher demand and firms are likely to increase employment. Improved public services. Higher economic growth leads to higher tax revenues (even with tax rates staying the same). With higher growth, incomes and profit, the government will receive more income tax, corporation tax and expenditure taxes. The government can then spend more on public services. Reduced debt to GDP ratios. Economic growth helps reduce debt to GDP ratios. In the 1950s, the UK had a national debt of over 200% of GDP. Despite very few years of budget surplus, economic growth enabled a reduction in the level of debt to GDP. Political aspect. Elected politicians have a vested interest in higher economic growth. Higher growth enables vote pleasing policies such as tax cuts and/or more public spending. Higher growth leads to improved tax revenues which can be spent on long-term public sector works, such as improved transport and communication. This helps long-term growth. Confidence to invest. Higher growth encourages firms to take risks - innovate and invest in future products and productive capacity. Inequality and distribution. Economic growth doesn't necessarily reduce relative poverty, it depends on the distribution of incomes. Economic growth could bypass the poorest in society. For example in the 1980s, the Gini coefficient rose sharply - the richest 1% gained dis proportionality more. Negative externalities. Economic growth can cause negative externalities such as pollution, higher crime rates and congestion which actually reduce living standards. For example, China has experienced very rapid economic growth but is now experience very serious levels of air pollution in major cities. Economic growth may conflict with the environment. e.g. increased carbon production is leading to global warming. Economic growth may bring benefits in the short-term, but costs in the long-term. It depends on what is produced. The Soviet Union has fantastic rates of economic growth, but, often through producing a lot of steel and pig iron that was not actually very useful. Economic growth can be unsustainable. If growth is too rapid, it will cause inflation, current account deficit and can lead to boom and bust. Does happiness actually increase? Theories of hedonistic relativism suggest (beyond a certain level) increasing output has no effect on changing life quality or happiness. 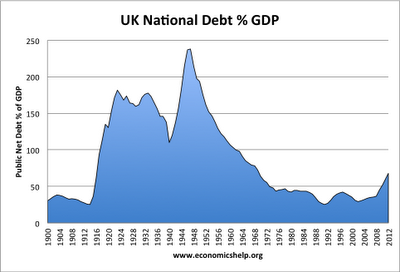 No one is explaining clearly WHY the UK deficit has got so much worse so suddenly in 2009. What items are (roughly) responsible for each part of the increase?